Here I am writing about the second book by a person I call the ‘Master of Corporate Democracy’ – Ricardo Semler. 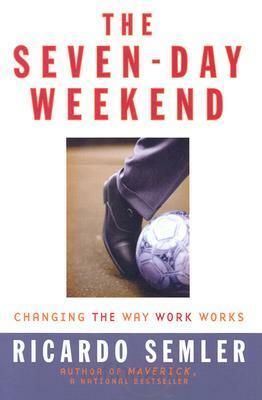 After reading his first book, Maverick, I could not resist longer reading his second book – The Seven-Day Weekend. While his first book Maverick! introduces us to some of the surprising facts and the live example of Corporate Democracy that is being followed at Semco; his second book gives us the complete sense of Why-it-is-a-success and how-did-they-do-it at Semco? Ricardo Semler has beautifully given the in-depth details and analysis on his vision for Semco with his unusual workforce management practices. It answered my question that was lingering in my mind since I read his first book – What is driving Semler to go beyond something unimaginable by others? Semco employs 3000+ people working in three countries in manufacturing, professional services and high-tech software. But even now, its experiments (can call sociological or anthropological) on having complete corporate democracy could never work anywhere else. It is only Semco that made it happen beautifully. They plunge ahead, defying the military and boarding school mentalities that are the backbone of traditional business structures. And they prove that in re-distributing the weekend across the workweek, their employees find balance and Semco makes money. As Ricardo Semler says, it is very simple – the repetition, boredom and aggravation hat too many people accept as an inherent part of working can be replaced with joy, inspiration and freedom. Right approach to employees always creates profit. The book begins with the basic questions like, Why are we able to answer mails on Sundays, but unable to go to the movies on Monday afternoons? Why can’t we take kids to work if we can take work home? Why do we think the opposite of work is leisure, when in fact is idleness? He has given the clear distinction between, the free time, idle time, leisure and personal time that makes us to think, and the balance between the personal life and the job is important for anyone. Ah! Yeah he is right! And very soon in the part 1 you will discover that there is no boundary or limit at Semco. They are into everything and anything when it comes to business. If I have a business plan in mind and if I convince and get majority the employees to vote, my business plan will be implemented. And in the part 2, you will be introduced to the ‘Calling’. Here, Semler answers some of the questions on Success and the Money. And he says, they are always distant relatives. At Semco, they believe in what they call the ‘Calling’ or the ‘Reservoir of talent’ in any person has to be used to the fullest. Only then the person will feel happy about his job and the career. They believe that the only legitimate power in a company is talent. And they attract talent from everywhere. In fact they have been known to place the ads reading: ‘we have no openings, but apply anyway. Come and talk about what you might do for us, and how we might create a position for you.’ Isn’t this crazy? Once the new employees are joined, they will be made to attend the ‘Scare off’ meetings where all they hear about unconventional practices and philosophies. Even though it will be difficult for the new employees to understand them in the beginning, slowly they will start opening their wings and freely do whatever they are asked to do in their own style. And once they start liking it, they will stick around in the company for long. And at Semco, there are no manuals, procedures and policies so that people are free to improvise, to soar, and to collect the moments of happiness that constitute genuine success. Because of their careful mix of talents, because of the self-selection process that goes on, Semco has less than one percent turnover. They rarely fire anyone. It is very surprising to read that, in 2000-2001, a total of three people out of three thousand quit on their own. Among many weird initiatives at Semco, Lost in Space is one among them. This program assumes that young recruits don’t know what they want to do with their lives. So the program is designed to help them decide by letting them migrate through the company for a year. They can do what they want to do, they can move wherever they want, they can go where their interests take them; they work for one, or three or even six different units. At the end of the year, anyone that the new recruit has worked for can offer a job or the recruit may seek an opening in any area that interests him or her. The chapter ‘it is not about the money’ is an absolute pleasure to read. In a way it is an eye-opener for many. It defines growth, success, profit and money very well. Answers some of the questions like, how much money is enough? If growth is necessary to success, how do we guarantee that it continues? What grows indefinitely? Why profit (beyond the minimum) is not essential for survival? Some of the stories that are explained under this chapter are absolutely brilliant. One will get the clarity on what is exactly required and what is not, just by reading those stories. What, if not growth or profits, constitutes success? A balanced mix where all do well. Where stock holders, employees, clients, suppliers and community are all canvassed for their opinions, and where this three-dimensional exercise results in a complete picture. They call such a score card which differs from other companies’ annual balance sheets that constitutes for success as The Fortunate 500 – a scorecard that enables them to compare progress, anticipate trouble and tweak their priorities. It is a barometer they have created to define success. By combining numbers and people, customers and suppliers, and government agencies and NGOs, they hope to produce a well rounded evaluation for the word success. Then comes the chapter Management by (O)mission. This chapter addresses some of the questions like – Why do we tell our employees that we trust them, then audit and search them when they go home? Why does our customized and carefully crafted credo look like everyone else’s? Why do we demand and go to war for democracy as nations, yet accept docility that no one has the right to chose their own boss? Seriously while reading this chapter I was reminded of my work and was thinking in the similar lines of Semler. Why do they trust employees and then they have audit process? If they audit for all the work we do, where is the trust factor? That means they are always doubtful about you. And I have been working in the current company for the past 3.5 years, the same security guard is at the entrance checks my bag everyday and he specifically checks for my laptop. Whether it is official or not? Now, having known me since 3.5 years, when he can talk all the stories of the world to me, why can’t he simply trust me that I do not carry my personal laptop into office? When I check with him, he says, ‘this-is-what-we-are-asked-to-do’ and ‘we-are-doing-this-since-many-years’! ah! Now, how many of us say the same thing at our respective jobs? This-is-the-way-we-need-to-work and this-is-the-process-we-need-to-follow. Giving up control is never a possibility at the company where I work. Everything is process driven. In my previous job, I was the Man-Friday of the company. I used to do everything and anything. Starting from HR, Sales, Finance and Business Development. At times I even worked as a cleaner. After all, it was a start-up company and I was given enough freedom to do things the way I like. But of course, we were in the process of setting up a ‘system’. But since I wanted to get myself exposed to an organized environment where there are existing systems and processes, I chose to quit and joined a big sized company. Here everything seems to be set. Even if I do not work, the process makes me work. And there is nothing like a calling that is required for the work. Anyone can do it. All that I need to do is to follow the process. Everything is controlled. Because of all of us following the process, the outcome is most certain. In fact, the person who is working sometimes is not of much importance at all. Because even if a person resigns, company will hire a new person and makes the process take over the new person very soon. There is absolutely no scope for my way of working or a new way of working. So everything is process-centric and not person-centric. At the end of completion of a year, we have to go through the appraisal and fill our own self appraisal forms. Everyone will know the results because we understand the process very well and the results are reflected to everyone. In spite of everything being process centric, we are required to think out-of-the-box and that is always an outcome of every appraisal cycle. I am at a loss here as there is no scope for thinking beyond the set process. Can I tell the compliance team that this is a new way of my response? But at Semco, there is absolutely no control on anything. No Audit. No Processes set. You are free to do what you want to and in your own style. Perhaps, this gives more productivity. Up’n Down pay – is a program where employees flexibly manage their pay. The idea is that moments in people’s lives are very different, one from the other – and that making it possible for them to adapt their pay and work hours accordingly. Employees would look to balance the company’s present needs with their own, and adjust the pay package accordingly. They have 11 ways of remunerating employees as well. Retire-A-Little – is a program where employees are free to retire at any age and work at the later stages of their lives. People can retire for a two months period now and work two months after their retirement. Work’n Stop plan – is a program where employees can take off longer periods (upto 3 years) for reasons of realizing dream, study, and travel or re-evaluate life. Along with 11 ways to remunerate people these programs make it easy to stay at Semco for decades, without forcing difficult choices on people when they yearn to take a break, go back to school, or have a family. Go/No Go Meetings – is a philosophy where, if anyone calls for a meeting, you have the right to vote whether to go or not to go. If most of the employees turn down the meeting request, it means the meeting is not much of important or the new idea is not appealing. Do nothing – is a philosophy to govern at Semco. In crisis or when something breaks down, the senior management will be at their best to do…nothing. This is because, by doing nothing, employees will be at their best to manage their crisis and there evolves the leadership. Why, why, why? – is the way every point is addressed in the meeting. By questioning repeatedly, they will come up with a new idea with a convincing strategy to crack the same. The last part in the book is my favorite. It is about ‘Rambling into the Future’. This is a very good collection of Ricardo Semler’s perspectives on every aspect of business, decision making, visioning for the future and his future thoughts. His preparedness for the future and what is it that one can have for the future (Everything!). I am not going to explain in detail about this chapter but it is one of the best read for anyone. And I wish him all the very best for the most unusual school he is coming up with. Of course that follows Semco’s way of thinking. While you read this book, and start getting to know about facts, everyday at your work, you will start observing things. And in the end, as Ricardo says, we will feel frustrated that they won’t apply to us. We are not in a position to adopt the Semco way and we feel we have no power! Becoming entrepreneur is the only hope if we need to adopt the Semco way! Now, Ricardo Semler has inspired me in so many ways. I just wish, one day I meet with him for a cup of coffee (not for the autograph, huh!). And who knows? He might just hire me! It is an amazing piece of work by Ricardo Semler on Corporate Democracy. All of us talk of Democracy but it is truly and religiously followed in Semco. Many examples quoted in the book very well supplement the philosophy followed and practiced at Semco. I second the comments of Srikanth and urge all to read the book. Thank you for a comprehensive annotation of what appears to be an excellent case study book. After reading your detailed summary I am inclined not to read the full text. After all, you have given all the key point to ponder. Quality-of-Working-Life or QWL has been around since Eric Trist of Tavistock Institute in London introduced the concept in the 1950s. It is terrific to see some company take to heart the idea of workplace democracy to its logical terminus and implement the idea. The railroad company at Kalmar in southern Sweden tried the idea of workplace democracy during the 1960s, got great public press, and then gradually returned to more conventional modes of management. Hope the company here does not follow the Kalmar Plant example. Wish more companies followed suit. It is my guess that given the widespread dissatisfaction among creative people in virtually all organizations, more and more organizations will have to adapt and adopt the idea or die. The case study here points the way to a successful future. Argumentative India may have an inbuilt advantage in adopting workplace democracy model.